Field efficiency means completing a particular field operation while wasting the least amount of time, fuel, and farm resources. The term refers to the time the operation should take vs. turning and other nonproductive time. For example, spending an inordinate amount of time turning around at the ends of short, wide fields or overlapping tillage operations within a field can result in higher fuel consumption per acre. Machine maintenance and repair also affect field efficiency – equipment that is well-maintained and in good condition operates most efficiently. To reduce turning time, farmers should strive to make fields large, long, and narrow by eliminating fence rows, ditches, or other barriers. Larger implements, if matched to tractor size, can be more field efficient because bigger implements cover larger areas and require a smaller number of turns. The concept of going “catty corner” or “tilling off the corners” of the field when tilling diagonally can also save fuel by having the turning result in a tillage operation. Controlled wheel traffic patterns can save fuel and reduce total soil compaction in a field. The tractor and other machinery operate in the same tracks for all operations, improving tractive efficiency with compaction occurring only in a narrow area. Crop growth in the uncompacted areas of the field is considerably better than if some compaction occurred all over; however, poor drainage or other problems may occur near the compacted zone. Deeper tillage results in greater fuel use. With every inch of increase in moldboard plowing depth, approximately 0.15 more gallons of diesel fuel per acre is used. There is a proportionate increase for other tillage operations at increased depths. Secondary tillage should seldom be performed deeper than one-half the depth of primary tillage. For example, if a field is plowed 8 inches deep, disking should be no deeper than 4 inches. Shallower secondary tillage has the added benefits of not only saving fuel, but reducing compaction and lessening the amount of wet soil and weed seeds brought to the soil surface. Water loss is also often reduced with shallower tillage, resulting in a longer period before first irrigation is necessary and/or better overall early plant growth. 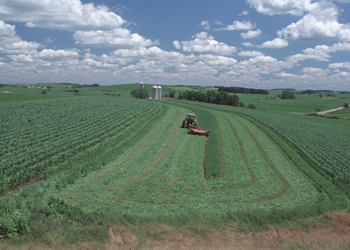 Crop conditions can affect the amount of fuel used in harvesting operations. A crop which is too wet, lodged, or harvested under wet soil conditions can increase fuel consumption. Where possible, under optimum crop and field conditions, proper machine adjustment and harvest can result in fuel efficiency. Harvesting less straw and stalks during grain combining by increasing height of cut can reduce fuel consumption as well. Global positioning system (GPS) guidance systems and auto-steer technology make use of the most efficient routes around a field, eliminating overlaps and skips.